INTERLINK’s Spring 1, 2014 end-of-term ceremony was held on March 6, 2014. Graduating INTERLINK student Jiayi Zhao (China) gave the opening remarks. Several awards were presented at the ceremony, including perfect-attendance awards, hardest-working student awards, module awards, and the outstanding student award, given to Nada Alnajjar (Saudi Arabia). We were also happy to recognize 19 graduates (listed below), many of whom plan to enroll full-time at UNCG for the Fall 2014 semester. The ceremony concluded with closing remarks by INTERLINK graduate Tianqi Luo (China) and several announcements by INTERLINK Director Dr. Brad Teague. The Spring 2, 2014 session at INTERLINK began on March 10, 2014. New students participated in an intensive two-day orientation, and classes for all students (new and returning) commenced on March 12. The Spring 2 session runs for nine weeks through May 9. INTERLINK welcomed 28 new students from the following countries: Brazil, China, Japan, Philippines, Saudi Arabia, South Korea, Togo, and Venezuela. Eight of these students entered with conditional admission to UNCG (seven to an undergraduate program and one to a graduate program). INTERLINK currently serves 136 students total. We held a welcome reception on March 14 to celebrate the end of the first week of classes and to allow new and returning students to get to know each other. diyarbakır travesti During the reception, students were invited to play an ice-breaker idiom game. Each student was given an idiom in English and instructed to find other people in the room with the same idiom. Once groups were formed, students introduced themselves, talked about what the idiom meant, and had their picture taken together. INTERLINK is pleased to welcome for the Spring 2 session five students from the Brazilian Scientific Mobility Program (BSMP): Juliano Slivinski, Luisa Thiara Melo Cardoso, Francisco Domiciano De Bem, Leticia Jordao Marques De Oliveira, and Jean Patrick Tremeschin Torres/. This program, which is funded by the Brazilian government and administered by the Institute of International Education (IIE), provides full scholarships to select Brazilian undergraduate students majoring primarily in the science, technology, engineering, and mathematics (STEM) fields. The scholarship includes six months of intensive English study, followed by a year of academic study and an internship. 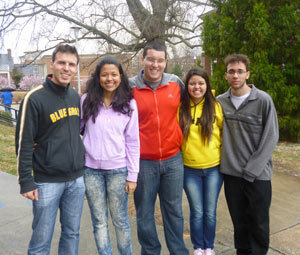 After students finish their exchange in the US, they return to Brazil to complete their degrees. More information about the program can be found online at http://www.iie.org/Programs/Brazil-Scientific-Mobility. For the Spring 2 session, INTERLINK also welcomed a new instructor, Katheryn van Laar. Katheryn grew up in Canada and the US and attended the University of Ottawa, where she completed bachelor’s and master’s degrees in Second Language Education. She has taught English in Canada at the University of Ottawa, in Georgia at a local library, and in China at Shantou University. We are glad to have Katheryn join our staff.